Dave Hajdasz grew up in Hartford, CT and lived the typical life of a city boy. He has always been drawn to the outdoors whether it was playing in the streets of Hartford or backpacking the Appalachian Trail in CT. He attained his BS degree in Chemistry with a minor in mathematics from Central Connecticut State University, then headed west to Indiana to get his PhD in Analytical Chemistry from Purdue University. Over the course of his professional career, he has held several positions in the fields of chemistry, information technology, performance improvement and most recently healthcare administration. He currently leads the Clinical Redesign team at Yale New Haven Hospital in New Haven, CT focusing on improving the quality and decreasing the cost of delivered care. 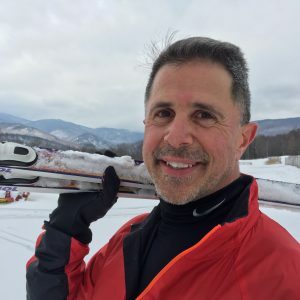 Dave is also a registered investment advisor in the state of Connecticut and operates a small financial planning business focusing on helping his clients plan for and transition to retirement. Dave lives in Cheshire, CT with his wife, Joanna, and first discovered the wonder of Vermont swimming holes while on vacation in 1998 when he stopped for a swim in the New Haven River in Bristol. He spent the next several years exploring, documenting and photographing his swimming hole adventures during his many trips to Vermont. His passion for swimming holes has catalyzed the publication of two swimming hole books: Take the Plunge, An Explorers Guide to Swimming Holes of Vermont and Swimming Holes of the White Mountains. In his free time Dave enjoys running, hiking, ice climbing, cross country skiing, fly fishing and, of course, swimming.